Former Kumho Asiana Chairman Park Sam-koo on Tuesday sent out a letter to the staff of Asiana Airlines apologizing for having to let go of the air carrier that was his “everything,” a day after the board of directors decided to put it up for sale to tackle the group’s liquidity crisis. “It is with a shameful and embarrassing heart as a person that has been leading the group to have had to come to this decision that must have sent all of you into shock and confusion,” Park said in the letter posted on the company’s internal bulletin. Recollecting significant moments for Asiana Airlines since its inception in February 1988, Park said Asiana was able to overcome turbulent times -- including the 1997 financial crisis, the Sept. 11 attack on the World Trade Center in New York, and the spread of deadly respiratory viruses -- because of the effort made by Asiana staff, who had made the company stronger. Bidding farewell, Park said he hopes Asiana will continuously grow as a world-class air carrier and stabilize financially. Launched as the nation’s second commercial air carrier in the same year the country hosted its first Olympics, Asiana has seen roller coaster growth since then, along with the rapid growth of the number of Koreans going overseas. In 2004, Park changed the name of the conglomerate from Kumho to Kumho Asiana, saying that Asiana was the pride of the group. Following years of financial hardships, the group’s board of directors decided Monday to sell the air carrier as part of a self-rescue plan, after initial plans were rejected by creditors. As the industry continues to reel from the decision, Lee Dong-gull, chairman of the Korea Development Bank, the main creditor of Kumho Asiana Group, thanked the former chairman for making “a difficult decision” and added that such a move has instantly restored market trust in the company. The process of selling the air carrier to a third party will take about six months, he said, adding that the creditors will pick an institution to arrange the transaction after renewing an agreement between Kumho Asiana and creditors by the end of the month or early May. Refuting media reports that estimated Asiana’s debts to be 7 trillion won, Lee said the air carrier has around 3.6 trillion won in debt. If injected with fresh cash, the company’s operations will be revitalized soon, he said. 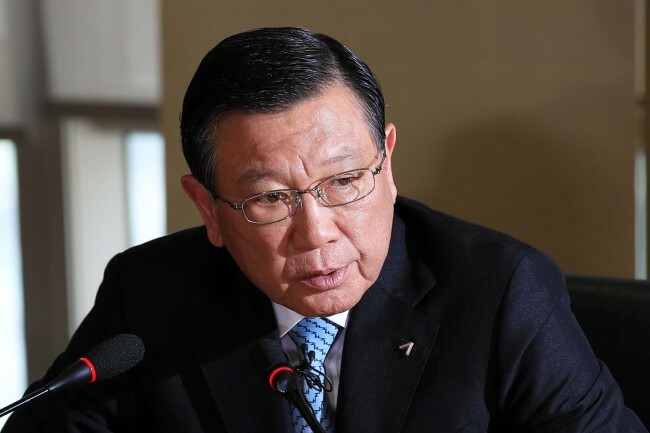 “There has been a lot of work already carried out to raise the profitability of Asiana and, it is an attractive company that can go into the black with some supplementary measures,” he told reporters. The KDB head’s rare comment on Asiana’s business potential appears to have been made to encourage other conglomerates to jump into the bid, after potential buyers, including SK, Hanwha and CJ, all denied market rumors that they are going to compete for a controlling share in the air carrier. The price of Asiana Airlines is estimated to be at least 600 billion won, including the management premium, but the potential buyer has to be capable of injecting at least 2 trillion won to normalize the air carrier’s operations, as the company is obliged to pay a loan of 1.3 trillion won within a year, according to market observers. The possibility of foreign funds jumping into the bid appears low, as the law on the aviation industry prohibits foreign management of a local air carrier.